Do you or your organization have questions about unclaimed property laws by state or reporting requirements? Unsure about the escheatment process? Within this page you will find some of the most frequently asked questions regarding unclaimed property reporting, escheatment and compliance. You can also find state-specific information, such as unclaimed property reporting dates by state, the unclaimed property dormancy period by state, escheat laws by state, unclaimed property reporting contact information, and additional state-specific resources. Register & learn what you should already be doing in preparation for Spring 2019 deadlines. What are unclaimed property reporting requirements? Unclaimed Property reporting is a complex process to say the least. Requirements and regulations can vary by both jurisdiction and property type. However, common requirements consist of filing a timely unclaimed property report, performing state-mandated due diligence, maintaining copies of reports and supporting documentation, and protecting any unclaimed funds until they are reported and transferred to the state.  To which jurisdiction(s) must I file an unclaimed property report? Every company has an obligation to report unclaimed property to the state of the last known address of the property owner. If that address is unknown, the property is to be reported to the holder’s state of incorporation. Organizations should be aware of the unclaimed property laws and regulations in each jurisdiction in which they do business in order to keep in compliance. Unclaimed property reporting due dates vary for each jurisdiction. 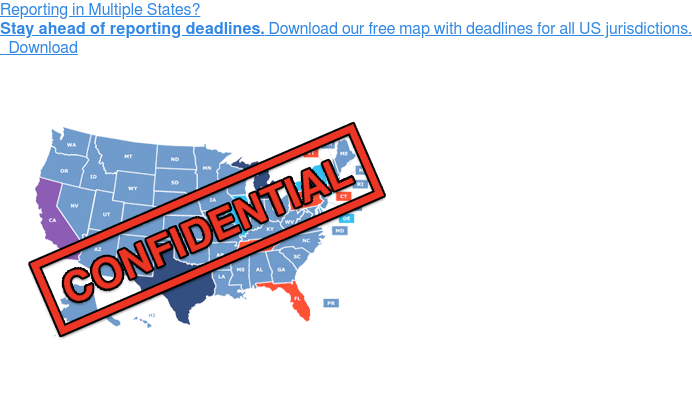 The majority of states have a Fall reporting deadline, usually October 31st or November 1st. Some states have a reporting or filing deadline in either the Spring or Summer. Some states also utilize multiple unclaimed property due dates depending on property type. What are due diligence mailings? Unclaimed properties due diligence mailings are notices that states require to be sent to the last known address of the owner of a property as indicated in the holder’s records. The purpose of the requirement is to give the owner one last opportunity to claim their funds or reactivate their account before it is turned over to the state. Over the years, states have placed greater emphasis on due diligence, with new or amended requirements on qualifications for due diligence, timing of the mailing, letter content, method of delivery and even attestations of mailing. What kinds of resources are required in an unclaimed compliance program? Organizations that have an effective unclaimed property compliance program incorporate stakeholders from all departments or lines of business that either create or are impacted by unclaimed property. This often includes the accounting, tax, or treasury departments; as well as resources from executive management, compliance, legal, investor relations, and IT. How long should my organization retain unclaimed property reports and records? A strong record retention policy is a valuable defense in the event of an audit. While it is recommended that organizations keep electronic records as far back as possible, each jurisdiction has varying laws and regulations defining the specific time-frame that organizations must retain unclaimed property records and reports. States enforce escheat laws through the use of state-sponsored audits and the imposition of penalties and fines for past-due property. How are unclaimed property audits conducted? Audits are usually conducted by third-party firms who work on behalf of one or multiple states. In many cases these firms are compensated based upon the amount of past due unclaimed property they uncover. Audits can last for years on end, and often consume valuable internal resources. If your organization is anticipating an audit, it is wise to seek the counsel of a holder advocate to assess and mitigate any potential unclaimed property exposure. If you are already in the midst of an audit, a holder advocate is able to ensure the scope of the audit is maintained and any estimations or extrapolations are accurate. How can I protect my organization from a state unclaimed property audit? While no organization is immune from an audit, a holder can take measures to minimize audit risk. These measures include having a lengthy history of reporting, a strong record retention policy, and staying up to date with rapidly changing unclaimed property laws and regulations. What is a Voluntary Disclosure Agreement (VDA)? A voluntary disclosure agreement, also known as a VDA, will allow your company to willingly come forward and report past-due property, usually in exchange for a waiver of the fines and penalties associated with overdue filings. VDA programs and their requirements vary by each state. If your company has not previously filed a VDA in a particular state, you may have the opportunity to complete this process. How can my organization apply for a VDA? It is best to consult with the respective state unclaimed property administrator regarding the VDA process. If you need assistance in applying for a VDA or navigating your way through completing the respective requirements, it is wise to seek out the services of a holder advocate or unclaimed property consultant. Should you have any specific unclaimed property concerns or additional questions, please click here to contact a Keane Holder Advocate. You may also call us directly at 800-848-8896.